It is estimated that approximately 250,000 cases of appendicitis occur annually in the United States, with a lifetime risk of over 8% in males and 6% in females. Since the first description of laparoscopic appendectomy by Semm in 1983, multiple studies have validated its use in the treatment of acute appendicitis. The most common complication encountered include wound infection and intraabdominal abscesses. At our institution we have noticed a subset of patients who develop postoperative bleeding often requiring further intervention. We performed a retrospective case series of all laparoscopic appendectomies performed at our institution over a two year period. Our aim was to find the incidence of postoperative bleeding after laparoscopic appendectomy, to identify factors that may predispose patients to bleeding, and what the morbidity of postoperative bleeding was. Between 1/1/05-3/1/07 a total of 711 laparoscopic appendectomies were performed. We identified 23 patients (3%) with postoperative bleeding. Of these, 74% were believed to originate from the staple line. Other cause included trocar site bleeding, injury to the small bowel mesentery, and bleeding from a hemorrhagic ovarian cyst. Thirty five percent of patients who bleed required reoperation and 22% required percutaneous drainage procedures. Nearly half of the patients required transfusions. The majority of morbidity was seen in the patients who bled from the staple line. We then tried to identify risk factors associated with postoperative bleeding including age, surgeon, operating time, pathology, preoperative medications and type of staple load used (2.0mm “grey” or 2.5mm “white”) (US Surgical) used to divide the mesoappendix. 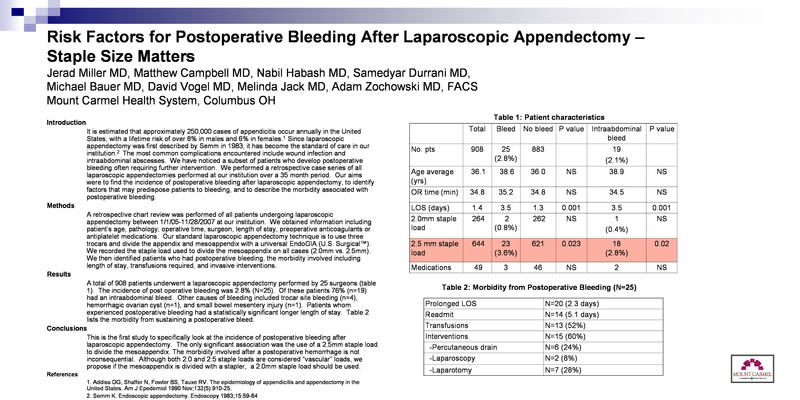 Use of the “white” staple load was the only statistically significant factor associated with post operative hemorrhage following laparoscopic appendectomy. In our review this is the first study to specifically look at the true incidence of postoperative bleeding after laparoscopic appendectomy. This also is the first study to identify which staple load appears to be superior even though both are termed “vascular”. With such a significant amount of morbidity associated with postoperative bleeding, the use of a 2.0mm “grey” load should be the standard of care for surgeons who utilize the staple technique.